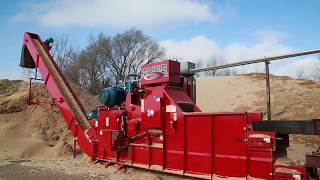 Watch the Rotochopper B-66 L-Series grind through hurricane debris in Panama City, FL. The Rotochopper B-66L horizontal grinder is engineered to tackle the toughest grinding applications including hurricane debris. Features like additional wear liners, a bolt-in anvil, 24 tooth 2” rotor drum and reinforced case enable the B-66L to tolerate substantial wear and tear. The lower, longer infeed hopper design allows logs, whole trees, and brushy materials to transition to the powerfeed effortlessly. Learn more about how the Rotochopper B-66 L-Series can increase overall production rates for your business today.